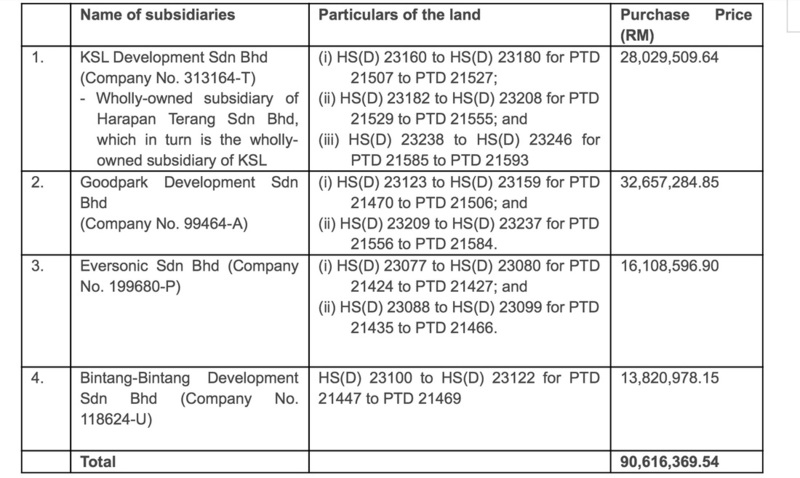 Jan 30, 2015: KSL Holdings Bhd (KSL) (through its 4 subsidiaries KSL Development Sdn Bhd, Goodpark Development Sdn Bhd, Eversonic Sdn Bhd, Bintang-Bintang Development Sdn Bhd) has started its land banking exercise for the year, by purchasing 297.2 acres of freehold agricultural land in Batu Pahat, Johor, for RM90.62 million or RM7psf. “The proposed acquisition will provide the group with the required land bank, and are expected to achieve medium to long term sustainable income growth and visibility,” KSL said in a filing with Bursa Malaysia.The parcels of land are purchased by four of KSL’s wholly-owned subsidiaries from Indah Corp Bhd — an investment holding company which operates the Bukit Banang Golf and Country Club. The RM90.62 million price tag was arrived on a willing buyer willing seller basis, it said, after taking into consideration, the development potential of the land and making comparisons with the market value of matured properties surrounding the land. KSL said no formal valuation was done for the purchase, as the Board viewed market comparisons were sufficient.